Sociology is dedicated to understanding human behavior, in particular how individuals and groups interact. International students who study sociology in the US will develop skills (both analytic and empirical) that are important for a wide range of careers. Additionally, studying sociology as an undergraduate provides a good foundation for further education in law or graduate school. 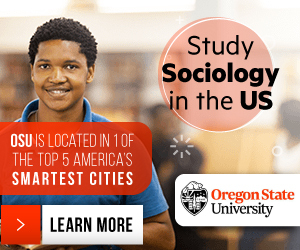 Why study sociology in the US? There are many reasons why studying sociology is a good choice for an international student. First, studying sociology provides students with a global perspective. Sociology analyzes different cultures, groups and societies throughout history. An international student studying in the US may find his or herself in a unique position to learn about other cultures from an international perspective, and will have the opportunity to exchange viewpoints with fellow students. Secondly, studying sociology teaches students both qualitative and quantitative research methods. Studying sociology will develop one’s ability to understand and conduct statistical analysis, survey research, ethnography, conversational analysis, and content analysis. These skills are important to jobs that require opinion polling, sales, market research as well as providing a foundation for further academic study. Additionally, studying sociology helps students develop analytic and critical thinking skills. Undergraduate classes in sociology require students to analyze and assess different theoretical perspectives and communicate those ideas through presentations and essays. As a result, studying sociology in the US helps students develop their ability to communicate difficult ideas effectively through speaking and writing. What will I study in sociology? Sociology is the study of how groups and individuals interact. Sociologists study a wide array of social interactions. For example, an international student could find themselves analyzing family groups, looking at how marriage, divorce and child-rearing have been defined in different cultures throughout different time periods. Alternatively, international students could find themselves analyzing the structure of governments and business, determining how this affects individuals throughout their community. Sociology also incorporates the study of social inequality and how race, gender, and class affect an individual and his relation to larger social institutions. These are only a few of the possible topics that students might find themselves looking into if they choose to study sociology in the US. Sociology doesn’t just stop there either. Other possible concentrations include studying the sociology of culture, science and technology, law and society, or international studies. Depending on the school you choose, you may find yourself looking at topics across a variety of spectrums, or perhaps you’ll focus on a specific concentration. Depending on the sociology department, students typically have the freedom to focus their studies around a single topic or to sample a broad range of fields. For this reason, it is important for international students who want to study sociology to research potential universities in the US carefully since each university’s sociology department may have different specializations and varying course structure. What career opportunities exist in sociology? An international student with an undergraduate degree in sociology has plenty of choices after graduation. Since sociology involves integrating ideas from economics, political science, psychology and history, studying sociology provides students with a foundation that is helpful for graduate study in these fields as well as in sociology. Additionally, the skills gained in sociology such as critical thinking and communication are also a natural transition into a career in law. Studying sociology develops those skills and, as a result, can be a good choice of undergraduate major for international students who are planning to go to law school after finishing their undergraduate degree. Studying sociology as an undergraduate is not only for those planning on attending graduate or law school. Graduates in sociology are working in a diverse range of fields from criminal justice to education. Sociology graduates are working in industry jobs such as advertising, consumer and market research, human resources and leadership training. Having a degree in sociology can also prepare students to work in government jobs that require social science or policy analysis. Graduates can also work for agencies such as social services, mental health services, adoption, and child-care services. So, why study sociology in the US? Studying sociology provides the analytic, critical thinking, research and communication skills that international students will find helpful whether they plan to find a career after their undergraduate degree or if they instead decide to pursue a higher level of academic studies. Visit the Study in the USA School search to find schools that offer programs of study in Sociology. Over time we will be updating this section and including more information for those who want to study sociology in the USA and for other countries, but please feel free to post your thoughts and comments on our Facebook fan page, and also follow us and post questions through Twitter.